Google+ Adventures with Baby Boo Bear: Introducing...Tushie Talk Tuesdays! I have decided to dub Tuesdays: Tushie Talk Tuesdays. 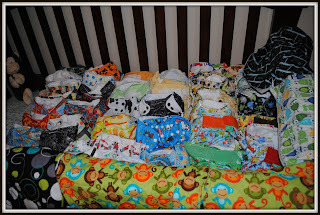 I will be devoting as many Tuesdays as possible to nothing but Cloth Diapering (CD). 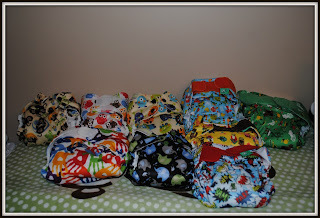 Most e-mails I get through the blog or boutique or just from people that I talk too are about....cloth diapering! 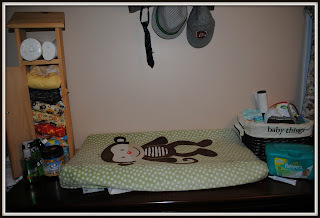 There are so many things to consider when getting started....fitted, AIO, pockets, flip...how to wash, how to store dirties, which brands are best. Wool, minky, polyester. And what the heck is PUL!???!!! Seriously, when we first started I was incredibly overwhelmed. I thought maybe I had made a big mistake in choosing the CD route (not that I would have EVER admitted that to anyone then!). I promise, if you are thinking of going down this avenue, it gets so much easier and the benefits far outweigh the negatives! Today I am sharing the basics of my stash and supplies! My stash!...sadly this is not the entire stash. There are about a dozen missing that are washing, being stripped and just plain ole dirty (plus I just ordered about a dozen!). There are Blueberry snaps, Swaddlebee Simplex Velcro's (All pockets). My absolute favorite on the right are my Tots N Bots Minky with Aplix. Gah. Heaven! If they weren't $25 a diaper my whole stash would be these! The swim dipes. 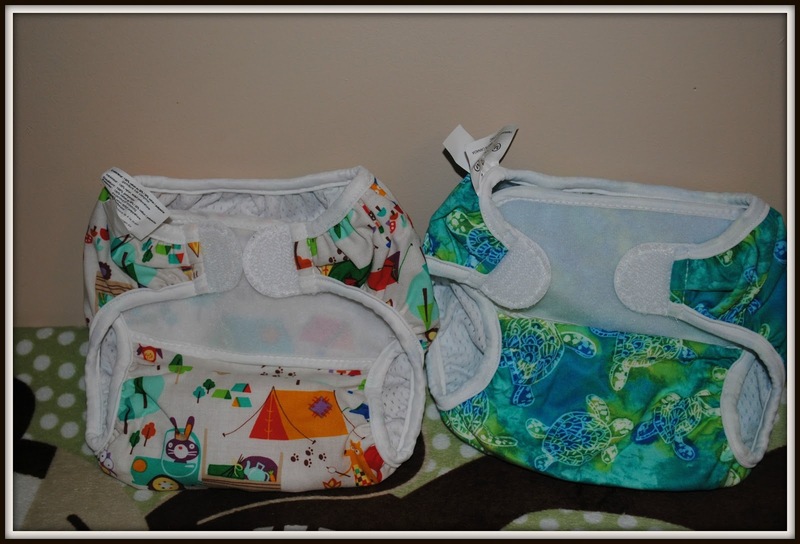 These are Bummi's reusable swim diapers. I buy them here. I use Rockin Green for washing (not pictured). We use Hard Rock because we have hard water. We have had no issues yet. It also comes in lots of fun scents! We like Watermelon. I also use - Funk Rock - this is a great alternative to stripping. It generally fixes the stinky dipes so a full stripping isn't necessary. Finally - Shake it up- you sprinkle a bit of this into the wetbag (or pail or you go that route) and the powder helps to keep the stink at bay! 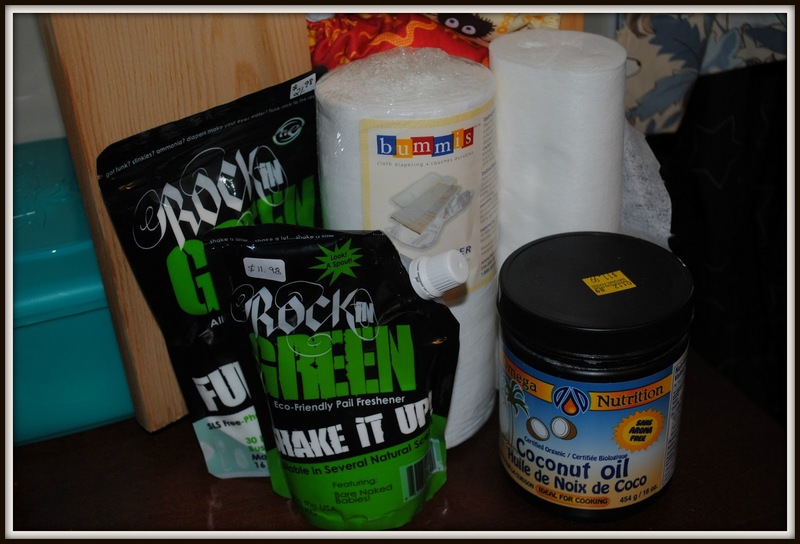 Also pictured: Coconut oil - we use this as a diaper cream (it is CD safe, most creams are not). If we have a bad rash we usually switch to disposables for a few days and break out the Zincofax. Bummi's Diaper Lines - These are flushable liners and are great now that Emmett's started solids and his poop isn't water soluble anymore. It just goes straight into the toilet! There you have it! The general overview of our CD system. My goal is to break down this info (and more) on Tuesday's as a reference, help or give me some pointers!! I am by no means an expert on CD!